If you have got navigational problems, then we have the compasses, sextants, and telescopes to ensure that you will never again have problems finding where you are or where you need to be! But in all seriousness, we carry some particularly fine specimens as far as our nautical navigational equipment goes. If directional navigation eludes you, then perhaps you need one of our many fine compasses. Each one is masterfully crafted from quality metals, and, more importantly, each one is fully functional, ensuring that never again will the cardinal directions confound you. 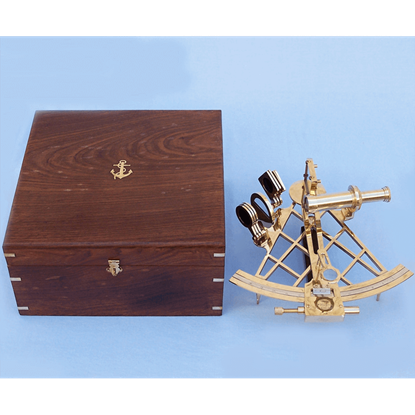 If you are a fan of celestial navigation, we have a number of functioning sextants, many of which are also made from brass, although in no way do we actually recommend you depend on our sextants for actual navigation. They are replicas, and while they function, they are not properly calibrated for actual use. And, of course, we have telescopes. We have a wide variety of optical devices, so if you want some awesome hand-held spyglasses, we have those as well in a variety of sizes and colors. We also carry full-sized telescopes made from solid brass. Oh, and our spyglasses and telescopes? They are all fully functioning too, so even if you do not plan on using yours any time soon, you can still pick it up and use it at a later date. 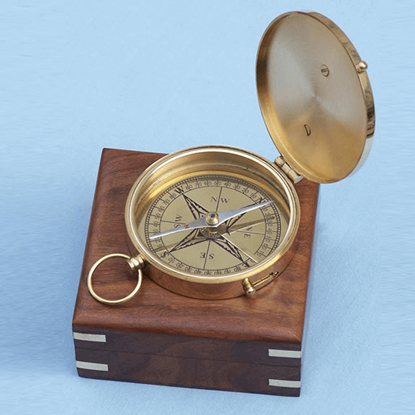 If you are interested in a different sort of nautical decor, maybe you should consider looking through our compasses, sextants, and telescopes. Not only are they all top quality, but many of them are still fully functional, which makes them more than just nautical decor and accessories. 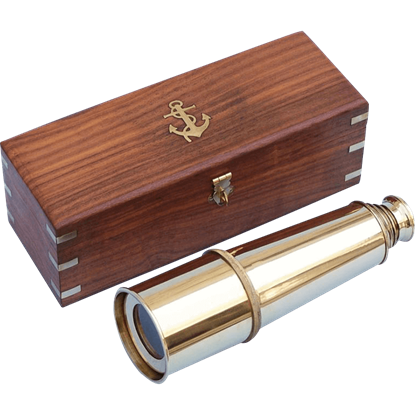 The Admirals Brass and Leather Spyglass is a great gift for the nautically inclined, perfect for feeling like an authentic sailor who is never without a trusty telescopic spyglass for looking upon things far off. 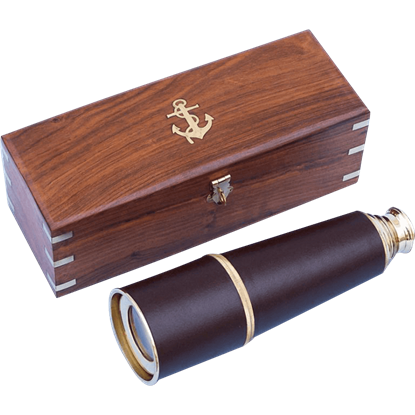 The Admirals Brass and Wood Spyglass is a great gift for a nautical navigator in your family. The spyglass measures 24 inches when its four brass tubes are fully extended and a compact 9 inches when fully collapsed. The German C. Plath sextant is regarded as the Rolls Royce of nautical sextants. The Admirals Brass Sextant is a beautiful, full-scale reproduction of this venerable item, the C. Plath micrometer drum brass sextant. 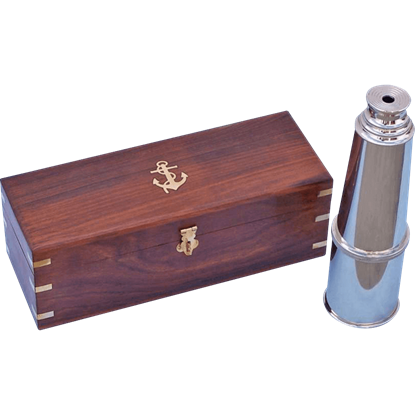 The Admirals Brass Spyglass is a great gift for a nautical navigator. The spyglass measures 27 inches when its four brass tubes are fully extended and 9 inches when collapsed. It is fully functional and great for distant viewing. 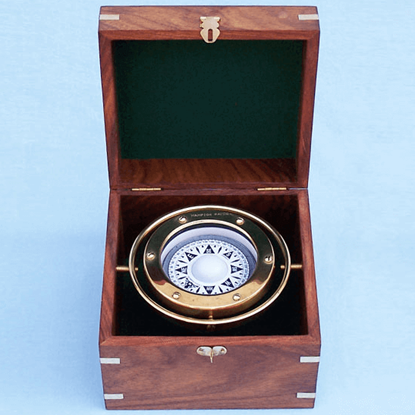 The Admirals Brass Sundial Compass is truly a great gift the distinguished nautical enthusiast in your life. This 4 inch diameter compass is a solid brass, fully functional, and features a solid brass shell and face. 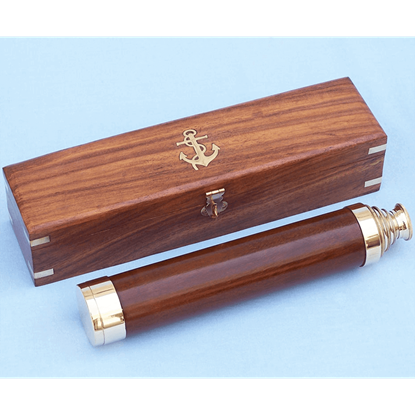 The Admirals Chrome Spyglass is a great gift for the nautically inclined, perfect for feeling like an authentic sailor who never goes without a trusty telescopic spyglass for gazing upon things far off. One of the most charming things about a reproduction is the eye for detail. 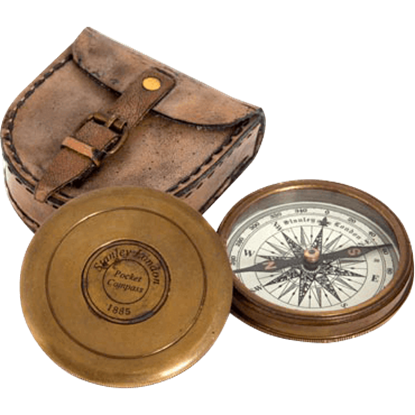 Our Antique Pocket Compass with Pouch resembles something straight out of the 19th century. The compass is coupled with a leather storage pouch. Finely crafted from solid brass, the beautiful Boxed Black Desk Compass is set within a hinged box carved of solid rosewood. This fantastic nautical piece is fully functional and makes an ideal gift for friends and family. 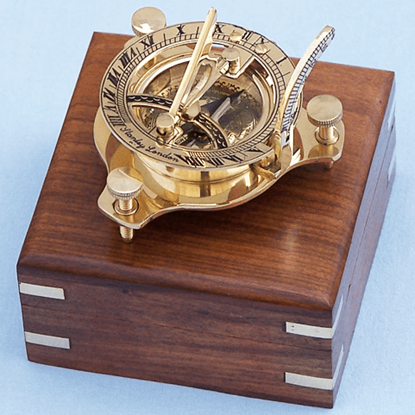 This is a beautiful Brass 3 Inch Sundial Compass. The top of the sundial is hinged and a curved scale is used to set your local latitude angle. The magnetic compass allows the sundial to be oriented north. 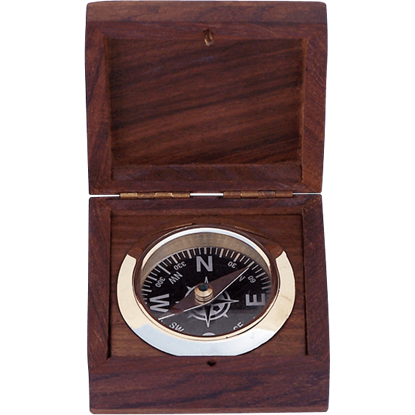 The Brass 4.5 Inch Gimble Compass is a beautiful reproduction of an antique brass British compass in a handsome brass-inlaid hardwood box. The compass is fully gimbaled with a solid brass double-gimbal. 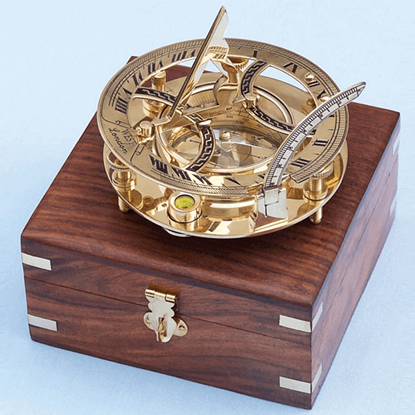 This is a beautiful Brass 6 Inch Round Sundial Compass. The top of the sundial is hinged and a curved scale is used to set your local latitude angle. The magnetic compass allows the sundial to be oriented north. 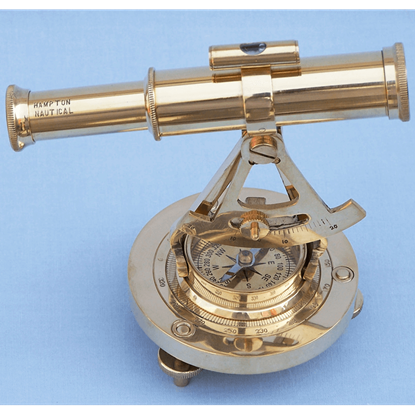 The Brass Alidade Compass, featuring a telescope with a bubble-level, makes for a beautiful nautical desktop gem, or it can rest perfectly on a mantel or bookshelf as an impeccable piece of nautical decor.